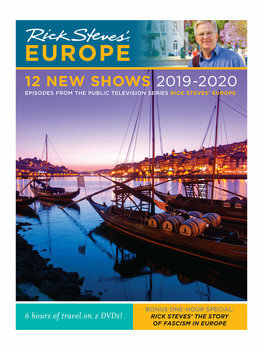 Limited edition: This two-DVD set includes the 12 newest shows from Season 10 of public television's "Rick Steves' Europe" series, with a bonus extra. Join Rick as he experiences the local culture, cuisine and fun in some of Europe's most interesting places: Sicily, England, Scotland, Portugal, and Greece — plus multi-country shows covering Europe's most exciting festivals and the skills of smart cruising. As a bonus extra, we've included Rick's 1-hour public television special, The Story of European Fascism. Upgrade your collection: If you already own Rick's "Complete Collection 2000–2016" DVD Box Set and his "10 New Shows 2017-2018" 2-DVD set, these newest shows will bring your collection up to date.